The Navy defines leadership as the art, science, or gift by which a person is enabled and privileged to direct the thoughts, plans, and actions of others in such a manner as to obtain and command their obedience, their confidence, their respect, and their loyal cooperation. Simply stated, leadership is the art of accomplishing the Navy’s mission through people. 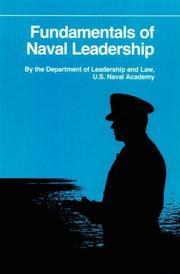 [i] To accomplish this, the Navy leader employs the principles of leadership, core values and the qualities that lead to success. A Midshipman at the United States Naval Academy, a student participating in an ROTC program, or an individual going through Officer Candidate School (OCS) are introduced to the fundamental leadership skills necessary to become a successful Naval and Marine Corps officer. This was one of the books I listed in last week’s “The Development of a Reading Program,” and is the second book I will read from my 2012 reading list. I encourage you to go online to order a copy for yourself and add it to your library. If you are interested in learning more about this book, and would like to acquire it, please visit this link at Amazon.com.